Buying tip - like all fresh fish, the gills of the hake you buy should be red - not brown. 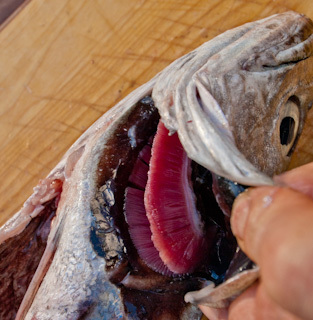 How to prepare hake - courtesy of Passionate About Fish. Hake is one of the most versatile fish available. Although the fish itself needs careful handling at sea the flesh is firm and white when cooked. When filleted it can be shallow or deep fried, baked, stewed or poached. Because it has few fine bones it can be steaked and the flesh pulls away cleanly from the bone when cooked. Two star Michel chef, Tom Aiken writing in his book, Fish describes hake as a mild fish with a more subtle flavour than cod. The flesh is more delicate in texture, but is moist and juicy and firms up on cooking. Roast darnes (steaks of fish on the bone) with butter, capers, green olives and sliced lemon and parsley added at the end. Alternatively, poach the hake in a court bouillon which is an aromatic vegetable stock flavoured with carrots, fennel, celery, leeks, star anise, pink peppercorns, thyme, lemon and orange peel, dill and tarragon. Make the stock the day before so it has had a day to marinate makes for more flavour for the fish.